SCAMMERS IN THE WORLD OF TRANSLATION. REALLY?! Tetras Translations has its own database of translators we work with. Before translators are accepted into this database, they naturally have to meet certain requirements. This involves verifying the translator’s skills and language knowledge with a test translation. “What day do I get paid on?” Payment for a test translation? “For every translation, I want you to pay 50 percent on delivery and the rest in a week.” Without the slightest trace of courtesy, Ms. (or as we later found out, Mr.) Ewa Madsen began sending e-mails about payment conditions. This is very suspicious behavior. So we decided to investigate the whole thing and find out more about Ewa Madsen from available sources. The first search result took us to Twitter. It said the following: “Translation scammer – Ewa Madsen – forged résumé – ewa0madsen9@hotmail.com.” We recognized her from her e-mail address and immediately ceased contact. On Twitter https://twitter.com/tsdirectory/status/726834363179110400 we also discovered other translation scammers who use phony names or assume the identities of real translators. They do not bother creating their own résumé, but just steal ones that are available online. Why? Their objective is to take work away from translators, ruin their reputations with a bad translation or a machine translation, and laugh their way to the bank. Most of them set up free e-mail addresses and “accept payment only through PayPal”. The translators feel that they cannot protect themselves, because misuse of résumés is not a criminal offense. So what can translation agencies do to prevent swindlers from doing damage to real translators? Free e-mail addresses: Gmail, Hotmail, Outlook, etc. Translation scammers are trying to refine their tactics. They attach résumés to phony profiles on ProZ.com and TranslatorsCafe.com, they constantly set up new free-of-charge e-mail addresses, but they do not want to be the center of attention. 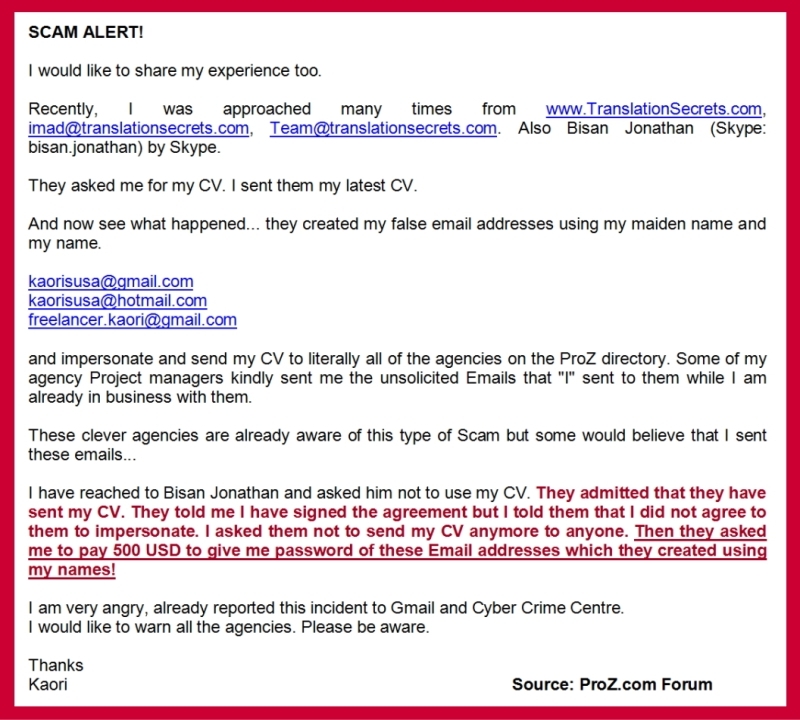 Translators and translation agencies should therefore use the option to publish the e-mail addresses, false résumés and/or phony names of scammers, or to verify identity through a video conversation on Skype. We would like to thank the portal Translator Scammer Directory for their efforts to “uncover the (falsified or true) identities of scammers and to damage or disrupt their activity to the greatest possible extent” and for maintaining the registry. They are motivated and cannot be stopped. If they are discovered, they assume a new name, steal new information and set up a new e-mail account. Dozens of spammers with falsified résumés fill our e-mail box every day. We already know their tricks. We successfully filter unwanted e-mails out. This problem affects us all. Direct clients get catastrophic translations from scammers, agencies lose money on retranslations, and translators wind up in the registry of translation scammers. In this case the strict criteria set forth in ISO 17100 for confirmation of translators are a wakeup call against any thought of superfluousness, intricacy or absurdity. Thanks to it, we work only with trustworthy people, just like any agency that complies with the procedures of the aforementioned standard. And how can customers protect themselves? By entrusting their translations to certified translation agencies. This is how to prevent problems with poor-quality translations and loss of money paid for translations that are not delivered. It hits the translators harder. They do not have many options for protecting themselves. How can you protect yourself from theft? You can follow the scammer lists and if you find your own name, draw attention to your own profile and publish the scammers’ e-mail addresses. Point things out, publish, and spread awareness of this problem! Uncover fraud right at the beginning, so that the scammer has no room to operate. We currently see this as the best way to fight it.